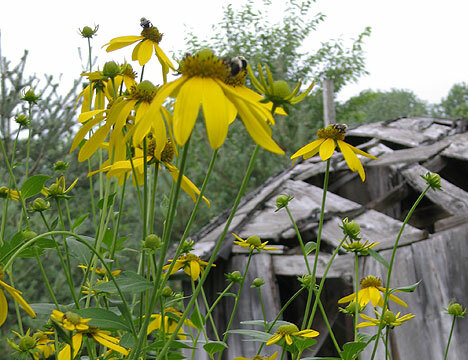 Black Eyed Susans, Sun Flowers, Goldenrod, a half-dozen leaves out of several hundred on the Butternut Tree, are all showing yellow, reminding us that though Summer will carry on for a few more weeks, she is beginning to fatigue, tire, anticipating relinquishing the year to Autumn. Raspberries are about ready to fall from the bushes, blueberries have been picked, gardens are producing faster than we can consume. The Almanac promises at least one more week of heat in August, one last blast of Summer; an opportunity to reasonably choose flip-flops to shoes, cotton to fleece, leisure to industry. As one sees more and more of it, time distorts. To a young person, a summer day, safely weeks away from the threat of school, filled with sun, swimming, laughter with friends, peanut butter and jelly sandwiches, fireflys and stars, may seem to last forever. To an elderly person, daily routine activities such as breakfast preparation, may seem to occur every half-hour; a week passes in what used to feel like the span of a day. 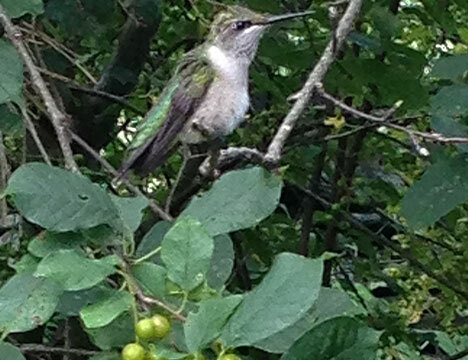 Recently, a female ruby-throated hummingbird seemed to be making an overture of friendship. She’d feed from the bee balm next to the office door, and rather than zooming off upon my approach, she’d alight on nearby branches, uncharacteristically curious. Blurred wings and sleek feathers in flight, stillness reveals that hummingbirds are somewhat scruffy at rest. Old wives’ tales say that hummingbirds never rest; always in flight, they have no need for feet, and so have none. Patience paired with careful observation reveals that hummingbirds do indeed rest. Summer days do last forever. Even though the more times we lap the sun the faster the cycle seems to complete, the moment one sees a hummingbird in flight, whether young or old, is exactly the same length of time. Metered precisely moment by moment by watches and calendars, time can appear to quicken and slow.